There are different ways to prevent yourself against these unwanted harassments with your wallet. Flexible	 What can we say, this is our solution. Since the start of electronic payments, we have been trying to make the electronic payments more safe. Our experience is that solutions only work if the usability is simple. 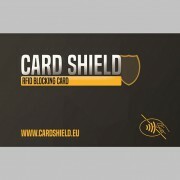 The Card Shield can be added to your wallet just like all other cards. That is all. No matter what kind of solution you use, the most important is that you use A solution and that you are aware of the risks.